This giveaway contest ends on December 19, 2009 at 11:59 p.m. PST. Keep coming back to this post to enter this contest daily, if you'd like, being sure to follow the simple rules below. For the MANDATORY ENTRY to win this prize, simply scroll to the bottom of this post and add a COMMENT there stating what you like most about this Gift Basket and the Glade Holiday Candles Collection. BE SURE to include your email address (in the comment form sign-in prompt box which is not visible to the public) so that MommyBlogExpert may contact you if you win. Glade was nice enough to send MommyBlogExpert's family an identical basket to the one we are giving away for this contest, so my kids and I could try everything out. I loved the way Glade created the theme for this basket which encourages family harmony during the holidays. To set the mood for our relaxing family evening, I lit the Glade Apple Cinnamon Scented Oil Candle, Limited Edition (pictured at left). As soon as it was burning my kids said that it smelled exactly like the homemade apple pies I love to bake. The fleece throw was so cozy -- light weight but warm -- and several of my kids cuddled together in this while watching the Polar Express DVD, Widescreen that was included. Considering my triplets are 12-1/2 and big brother is 14, that is pretty amazing that they actually got along together for a few hours. As the kids snuggled, watched the video, and sipped the scrumptious Bellagio hot chocolate that was included in the gift basket, I was able to sneak off for an hour and a half, light the Glade Bayberry Holiday Collection Candle in the bath (pictured at right), and enjoy the Village Naturals Therapy Mineral Bath Soak. I can't imagine a more peaceful evening than this (for both kids and their weary parents) so I am really excited to be giving away another basket just like it in this contest and I hope the winner enjoys it as much, if not more, than our family has. 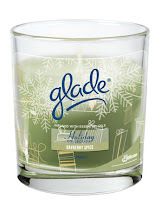 FTC Disclosure: The gift basket and its contents included in this giveaway is contributed by The Glade Holiday Candles Collection. A second identical basket was provided for MommyBlogExpert's family to sample all the items included in the giveaway. MommyBlogExpert did not receive any payment or other compensation associated with this post or this giveaway contest. See complete FTC Disclosure information that appears at the bottom of MommyBlogExpert's main page and at the bottom of every individual post on this blog, including this one. This basket sounds great. the scents look lovely and I would love to see the movie in the basket. I love the whole but especially love the fleece blanket. I love having blankets around the house during winter. I love the way that all the items in the basket, including the Glade candles are exactly what you need for a great, cozy and relaxing cold winter day. I love the huge variety of products! I would love the basket! i've been burning my barberry glade candle all season -- LOVE IT!!! Must have candles for holiday. I follow you daily and retweeting. living in the wilderness,i don't get a chance to see such lovely items. 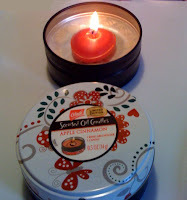 Of course I love the Glade candles, but I'm a basket fanatic and really love the woven tote :) *Thanks* for the giveaway! 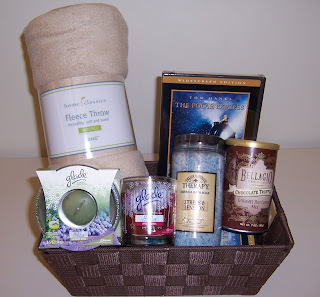 CONGRATS to Confessions of an Overworked Mom, the WINNER of The GLADE Gift Basket!